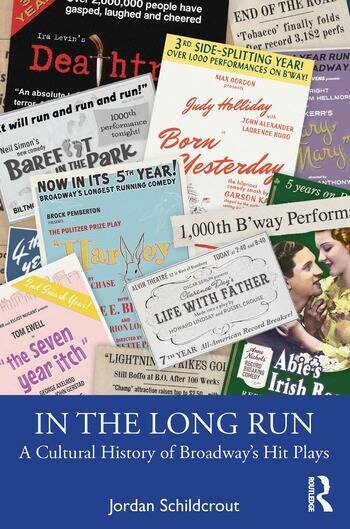 In the Long Run: A Cultural History of Broadway’s Hit Plays presents in-depth analysis of 15 plays that ran over 1,000 performances, examining what made each so popular in its time—and then, in many cases, fall into obscurity. Covering one hundred years of theatre history, it traces the long-running Broadway play as a distinct cultural phenomenon that rises and falls from 1918 to 2018. Each chapter focuses on the longest-running plays of a particular decade, synthesizing historical research and dramaturgical analysis to explain how they functioned as works of theatrical art, cultural commodities, and reflections of the values, conflicts, and fantasies of their times. At the heart of each play’s history are the ideological contradictions often present in works of popular culture that appeal to diverse audiences, particularly around issues of gender, race, class, and sexuality. Suitable for anyone with an interest in Broadway and its history, In the Long Run explores the nature of time in this ephemeral art form, the tensions between commerce and art, between popularity and prestige, and the changing position of the Broadway play within American popular culture. Jordan Schildcrout is Associate Professor of Theatre & Performance at Purchase College, SUNY, USA. His recent publications include the book Murder Most Queer and articles on plays of the gay liberation era in Modern Drama and JADT. He also works as a dramaturg in New York City.